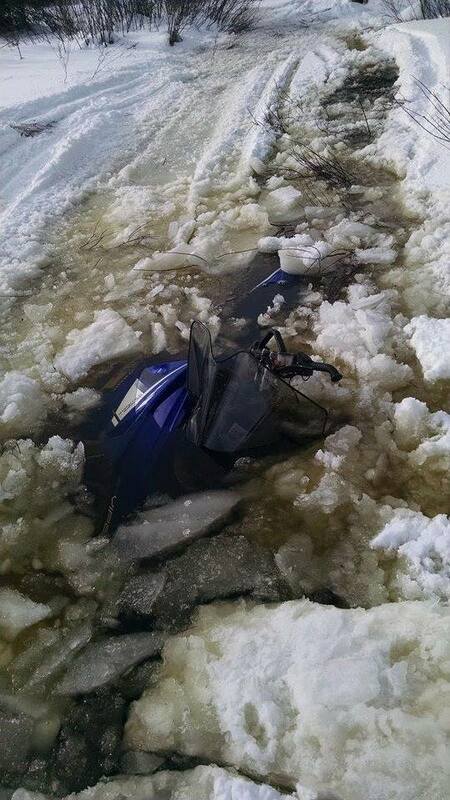 It’s that time of year when the winter cold comes in, the snow is falling and snowmobilers are anxious to ride. Many get impatient and head out to ride on closed trails. 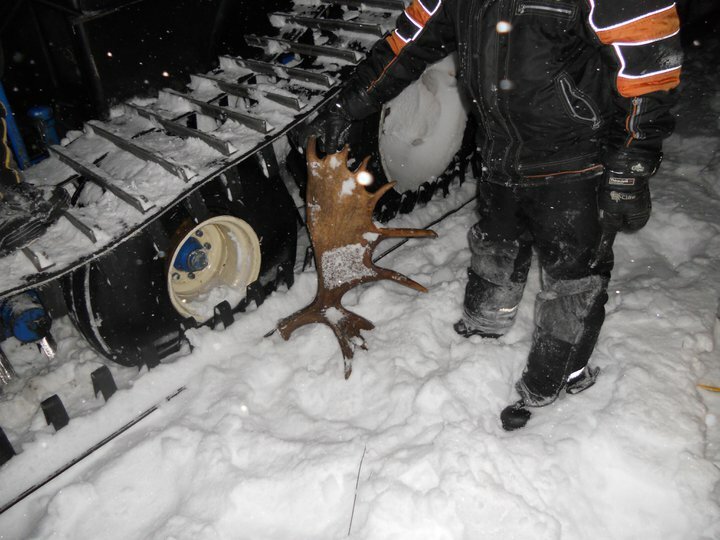 This can bring a lot of unnecessary problems—getting their local clubs in trouble with landowners or damaging their sled by hitting wet spots and getting stuck or hitting an obstacle under the snow. Next thing you know sledding season is already over before it even ever started. When you go on sled forums on the Internet at this time of year you can read people asking why clubs are taking so long to open up trails, “What are they doing? 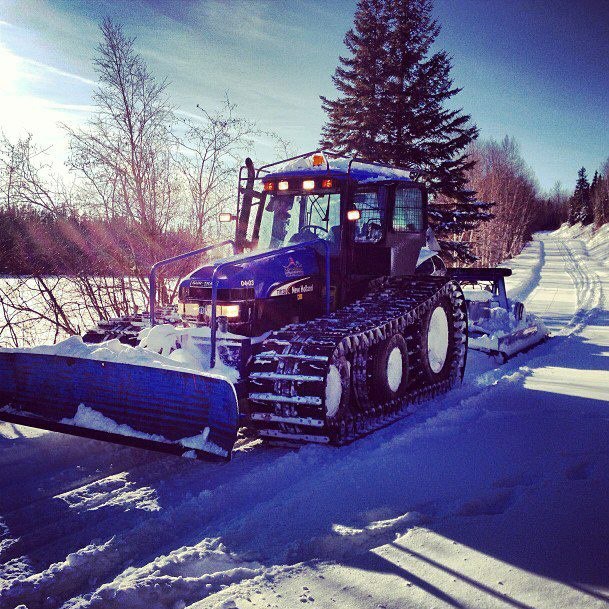 Why are the trails not groomed?” Well guys and gals…. 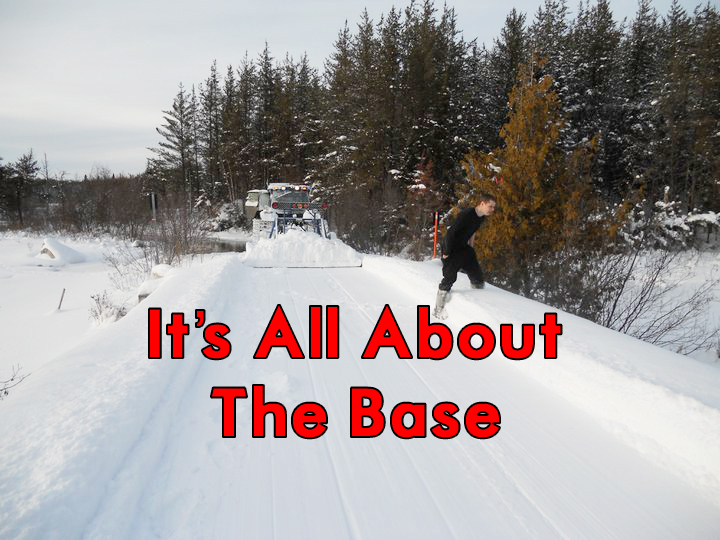 It’s like the song says “It’s all about base”. There may be plenty of snow out there, but if it’s not cold enough and the ground and water holes don’t freeze up, clubs could get in big trouble. When you ride those pristine trails in the winter you don’t see what’s under that trail base, you would be very surprised to see what you are riding on. There are areas that you see in the summer where the terrain is so bad you couldn’t even take an ATV or a big tracked machine over them. 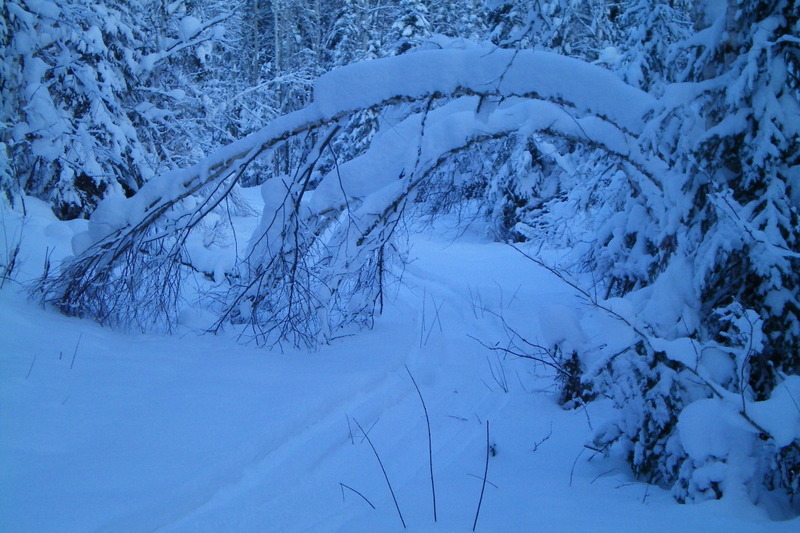 The trails may have plenty of snow cover but under all that snow there is danger waiting to happen—problem spots that the groomer operators and trail coordinators know about and will take care of. We have to remember the people involved in the clubs are riders too. Just like you, they’ve been waiting all summer long but even with their thumbs twitching to ride, they wait for it. At this time of year we need the help of Mother Nature. So far this year she’s being helping us with some cold then snow, some rain/drizzle, some more snow and rain, snow and rain again….. A regular person would ask: “And that’s a good thing?” Well, ses it is—we need that. The wet snow cold mix creates the perfect trail base—it makes the snow like concrete. When you groom over the winter it really helps you when you need to dig deep to cut those big nasty moguls. You also don’t hit as much dirt on the trails, saves you from hitting rocks, and helps in spots where the trail gets more abuse like the crest of small hills or sharp curves. It takes a lot of work to get these trails ready. 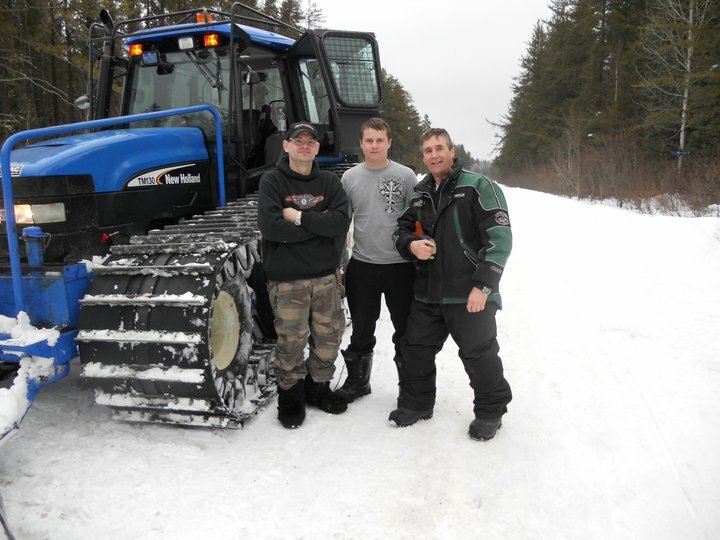 Clubs go out early and pack the wet areas and swamps with widetrack snowmobiles, forcing the cold deep and helping to freeze those wet spots. 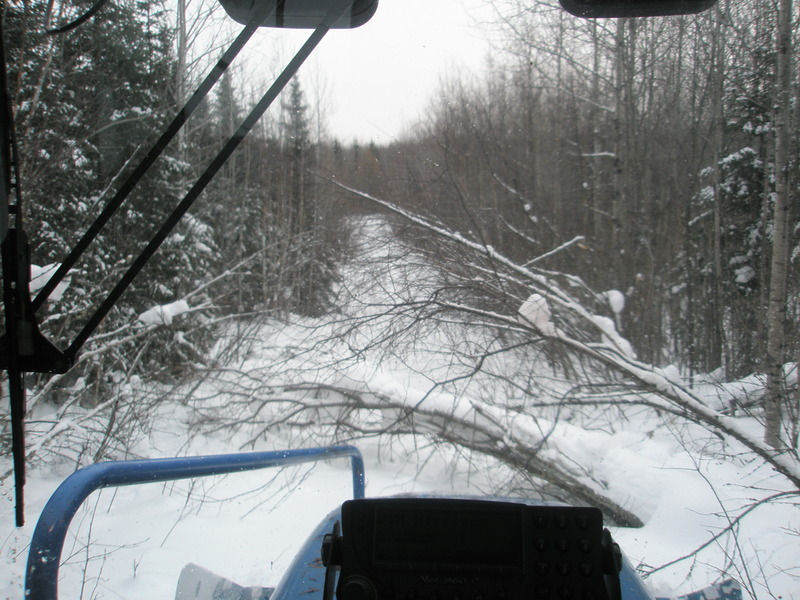 There are fallen trees and brush to cut, washouts to be filled in, flooding from beaver dams to deal with, snow fences and stakes to be put up, stake lines to be put up on lakes. 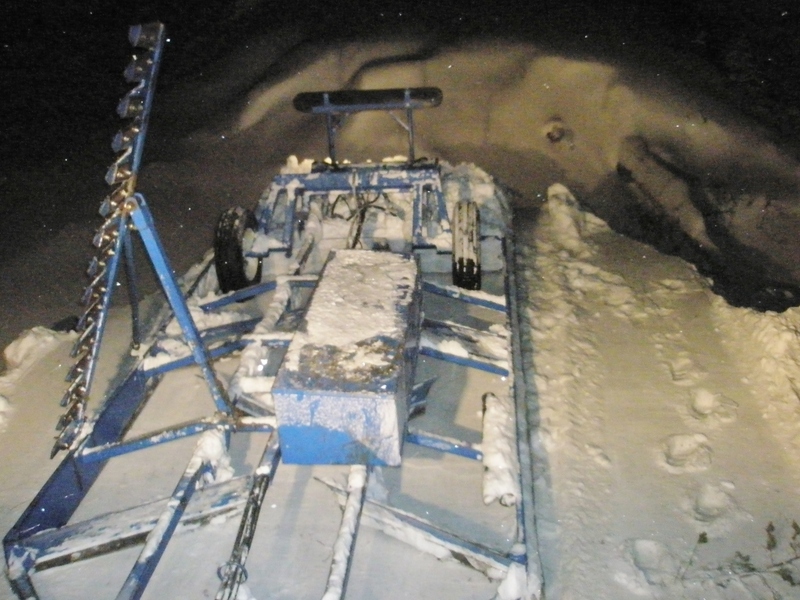 Flooding of rivers is done to increase the ice thickness so the groomer can cross sooner. All the mandatory signs have to be put up so that the trails are safe. I’m sure I’m leaving out plenty other tasks, details that need to be done before the trails open, but this gives you an idea of what goes into opening up the trails at the start of each new season. While you’re waiting (it won’t be long now! ), why not work on planing your next trip? Visit some Facebook pages and follow them. 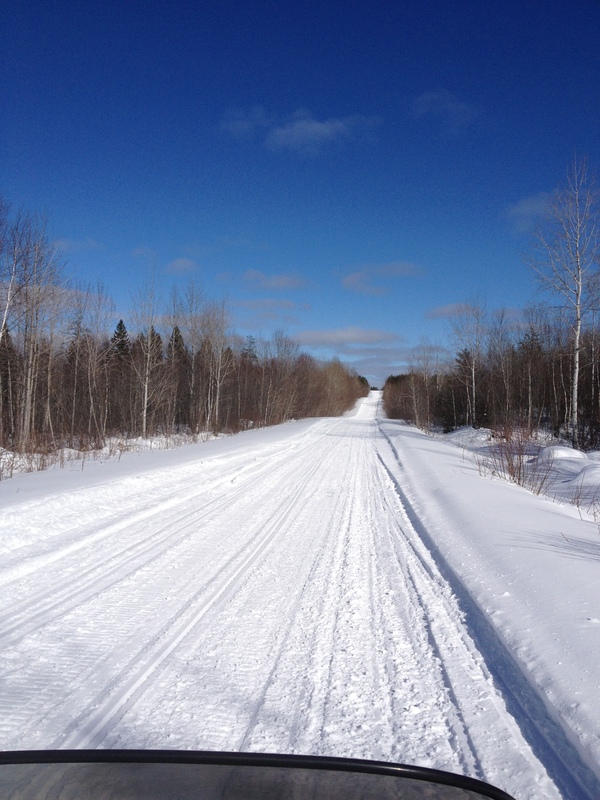 Jeff McGirr made a list: “10 Ontario Snowmobile Pages to Like This Winter“. Take this time to enter some sledding contests. There is a cool one going on right now: “Win the Braap” Canadian mixed martial artist and Sturgeon Falls native, Mitch Gagnon will invite one ‘super-fan’ who proves he or she needs a break as much as he does on a post-fight sled (or ATV) ride in his home-town. If you are a club volunteer, don’t forget to check out the contest Yamaha and the Ontario Tourism Marketing Partnership (OTMPC) have put together. They’ve promised to bring Yamaha Canada’s Snowmobile Power Tour to the first group (a club, district, region or combination) that has enough Early Season Priority (ESP) trails to make up one day’s worth of riding. The trails must be fully open and available to ride. Learn more about it here. Take this time to listen to the podcasts from the guys at What a Ride, they have 2 podcasts out right now, very entertaining. I download them and listen to them while I drive…got to love technology. It’s going to be an epic long riding season. Be patient. Trails are just starting to open up in the north. take this time to plan those trips and rides, and stay safe.